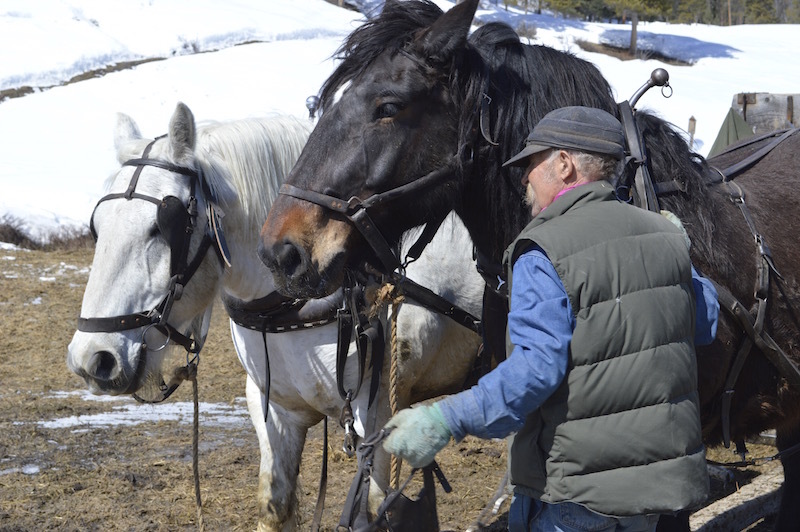 As he does every single morning from November into April, Bondurant, Wyoming, rancher Kevin Campbell leads his two draft horses, Ed and Smoke, out of their pen and harnesses them to the hay wagon to feed elk. The elk are not domestic or farm-raised animals, but wild, native, and free ranging through the mountains on the south end of the Greater Yellowstone Area. Dell Creek Feedground, tucked into the Gros Ventre foothills, is one of 22 run by the state Game and Fish Department in western Wyoming. 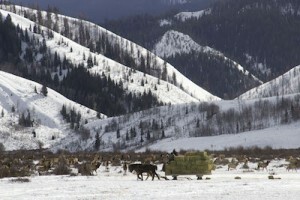 The agency pays Campbell $60 per day throughout the winter to scatter bales for elk. Rancher Kevin Campbell harnesses his team of horses to deliver hay to elk at the Dell Creek Feedground. Photo by Emilene Ostlind. By now, the last week in March, snow is pulling back from the hillsides and the elk trails are melting into wide, muddy swaths. Most of the state feedgrounds have already shut down for the spring, and this one will close soon. The elk will follow the spring green-up into the mountains where they’ll stay until the fall when snow drives them back down. Then, rather than heading out into the valleys as they did historically, some elk will aim for the feedgrounds. Why control elk distribution? Historically, it was to keep elk from marauding ranchers’ haystacks in the winter. A couple hundred head of elk could destroy an entire winter hay supply in just a few days. And a state statute makes the Wyoming Game and Fish Department liable to ranchers for damages to stored crops caused by wildlife. The agency quickly learned that it was easier, cheaper, and more amicable to stop the elk at feedgrounds and serve them their own hay than it was to replace wrecked haystacks in the middle of winter. Plus some of the feedgrounds help elk survive the winter in places where populations wouldn’t fare well without the assistance. But today the feedgrounds serve an additional purpose. They keep elk from transmitting a disease called brucellosis to cattle. Brucellosis is a bacterial infection that causes animals including elk, bison, and cattle to abort their calves, go lame, and produce less milk, all of which means lost money for producers. It also afflicts humans with a terrible fever that comes in waves over months or years accompanied by depression and night sweats that smell like wet hay. In the 1920s and 30s it ran rampant through U.S. livestock herds and sickened tens of thousands of people. In 1934, the U.S. Department of Agriculture launched the State-Federal Cooperative Brucellosis Eradication Program, and has since spent over $3.5 billion to get rid of the disease in livestock herds. 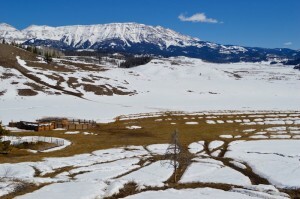 Elk paths melt out of the snow in late March at the Dell Creek feedground in the foothills of the Gros Ventre Mountains. Photo by Emilene Ostlind. Most efforts have focused on a combination of calfhood vaccination and test-and-slaughter. Gradually, state-by-state, brucellosis has come under control. It wasn’t until February 2008 that the U.S. Department of Agriculture announced livestock in all fifty states plus Puerto Rico and the Virgin Islands free of brucellosis infection. Now, wild elk and bison in the Greater Yellowstone Area harbor the last remaining reservoir of brucellosis in the U.S. In many ways, thanks to nation-wide collaborations and aggressive action, the brucellosis eradication story in North America is one of triumph. Still, ranchers in the Greater Yellowstone Area don’t see it that way. They are at the center of the last remaining battle against the disease. The federal government is pulling back from efforts to eradicate it there, leaving that challenge up to Wyoming, Idaho, and Montana. And wildlife managers, charged with protecting wild elk and bison as well as reducing disease transmission to domestic livestock, must navigate longstanding politics as they seek to improve scientific understanding of brucellosis and develop better management. There are a few stories explaining how the disease got into wild elk and bison in Yellowstone. One claims it came from cows brought to the park to provide fresh milk for park workers. Another blames Charles Jesse “Buffalo” Jones, a Yellowstone National Park game warden who released hand-reared bison calves, likely infected via cows’ milk, into the park to reestablish the depleted herd. Ongoing genetic research of the DNA from hundreds of stored brucellosis bacteria samples indicates Yellowstone wildlife infections probably came from multiple livestock spillover events. However it happened, brucellosis, introduced from livestock, persists in Yellowstone, mostly in bison who bunch up together and also in elk. Now ranchers fear transmission from those wild animals back to livestock. During the third trimester of pregnancy, usually in March to May for elk, the Brucella abortus bacteria proliferates in the womb, thriving on erythritol, a sugar in fetal fluids. It overwhelms the fetus, killing it and causing the mother to expel it. The aborted fetus swarms with billions of bacteria. If another elk or a beef cow sniffs or licks it or otherwise comes into contact with those fluids, she will become infected, continuing the cycle. Spring is the most likely season for transmissions, and the most dangerous time for elk to mingle with cattle. When brucellosis does get into a livestock herd, it brings serious economic repercussions for the rancher and impacts the livestock industry throughout the surrounding region and state. Zac Roberts was one of the last ranchers in Wyoming to have a “hot cow.” Back in the winter of 2008 two of his beef cows aborted their calves, and that spring when he sold them for slaughter, their blood tests showed up positive for brucellosis. That triggered blood testing for his whole herd, and the testing turned up more “hot,” or infected, cows. It’s likely the spillover came from elk on the nearby Franz Feedground, adjacent to one of Roberts’ pastures. Roberts had to quarantine all of his livestock on his private land in the Upper Green River Valley just north of Daniel, Wyoming. In the summer, ranchers in this area usually move their herds onto public national forest land grazing allotments in the surrounding mountains while they grow hay down on their private land. Cattle from different herds mix on the forest allotments. A herd in quarantine can’t go to its summer allotment. That means the animals eat through the summer what is meant to be hay stored for winter. Roberts’ infected cows bumped Wyoming from “Class Free” (no brucellosis infections in livestock) to “Class A” (less than 0.25 percent of livestock herds have a brucellosis infection) status. The move to Class A status triggered additional testing for all producers. To remain competitive in the cattle market, states strive for Class Free status. Wyoming had achieved Class Free status in 1985, and maintained it for nearly two decades. Then, in 2003, brucellosis showed up in a cattle ranch near Boulder, Wyoming. The suspected source: elk packed onto the nearby Muddy Creek Feedground. Before the cattle could be destroyed, they infected another herd. Wyoming lost its Class Free brucellosis status in February 2004, and later that year, two more herds in Teton County, Wyoming, showed up positive. Ever since then a couple of cattle or domestic bison herds per year in Wyoming, Idaho, or Montana have been infected, including Roberts’ herd in 2008 and herds in Park County, Wyoming, in 2010 and 2011. Feeders distribute hay for wild elk on a western Wyoming feedground. Photo courtesy Mark Gocke/Wyoming Game and Fish Department. 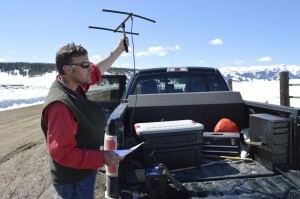 In 2009 and 2010, Wyoming, Montana, and Idaho worked with the U.S. Department of Agriculture to outline “designated surveillance areas” in the Greater Yellowstone Area. Ranchers inside the DSAs, regions defined by elk and bison herd units known to have infected animals, are treated separately from ranchers across the rest of the state as far as brucellosis testing requirements. Now, even if the DSA loses Class Free status, ranchers in the rest of the state are free from sanctions. By the end of summer 2008, Roberts’ herd was still widely infected and neighboring ranchers whose cattle had mixed with his the year before were testing their herds. (It looked like one of them was infected, too, but that turned out not to be the case.) Meanwhile, Roberts saw no end to the quarantine, and the whole state was waiting for him to clean his herd so Wyoming could regain its Class Free status. His only remaining option was a whole-herd buyout by the U.S. Department of Agriculture. Roberts is still struggling with the aftermath of his herd’s infection. Meanwhile, Wyoming cattle herds are brucellosis free for now, but it’s only a matter of time before the disease jumps from elk to livestock again and another herd tests positive. In the meantime, ranchers and wildlife managers in the western part of the state are searching for ways to slow or stop the disease. In 2001 Brandon Scurlock, who’d always wanted to work in the west, moved from Kentucky, where he’d recently finished his graduate studies on ruffed grouse, to Pinedale, Wyoming, for a job in the Brucellosis Program at the Wyoming Game and Fish Department. His task was to study brucellosis in elk and use collaboration to find management solutions. In 2004 he moved up to become the Brucellosis Program Manager. Wyoming Game and Fish Department Brucellosis Program Manager Brandon Scurlock has been involved with several research projects to improve understanding of how elk carry and transmit brucellosis. Photo by Emilene Ostlind. “Elk are neat critters,” he says. “You have to respect them when you work with them. They can eke out a living wherever they are.” His objectives as Brucellosis Program Manager include both preventing transmission of brucellosis from elk to cattle and reducing (or eliminating) the disease in elk. That’s where the feedgrounds come in. They are in place to protect livestock, but they also elevate the disease in elk. While only about 1-3 percent of elk that spread out on native winter ranges show signs of exposure to the disease, 15-60 percent of crowded-together feedground elk carry brucellosis antibodies. Scurlock’s challenge is to spread elk out so they won’t pass the disease around while packing them together to keep them away from cattle. When Scurlock started, brucellosis control efforts were mostly focused on managing habitat around feedgrounds to encourage elk to disperse during calving season, and vaccinating feedground elk by shooting them with bio-bullets containing Strain 19, a brucellosis vaccine. Scurlock got to work studying how elk carry and transmit the disease in a search for better management solutions. For starters, no one really knew how many “seropositive” elk—those whose blood showed antibodies to brucellosis—were actually contagious. Elk might be seropositive if they had recovered from the disease in the past, or if they were exposed to it and their immune system built enough antibodies to fight it off. The quickest way to test for infection in an animal is to look for antibodies in the blood, but seroprevalence doesn’t necessarily mean the animal carries the bacteria or is infectious. Scurlcok and his colleagues at the Wyoming Game and Fish Department and the University of Wyoming saw an opportunity to answer this and other questions when the state started a test-and-slaughter campaign. The state Brucellosis Coordination Team, established by Wyoming Governor Freudenthal after the brucellosis outbreak in 2003-04, recommended the Wyoming Game and Fish Department conduct a five-year test-and-slaughter program to reduce brucellosis in feedground elk. Because test-and-slaughter had worked to cull the disease in livestock, the team wanted to see if it would work in elk as well. “We built the mother of all elk traps and caught a whole bunch of elk and tested them and held them overnight and eliminated the positives,” says Frank Galey, chair of Wyoming’s Brucellosis Coordination Team. From 2006 to 2010, the program destroyed over 200 elk on three feedgrounds at a cost of $1.2 million. Seroprevalence at the Muddy Creek Feedground dropped from around 37 percent down to about 5 percent during the test-and-slaughter program. “It worked pretty well for a few years and then the instances just came back up,” Galey says. By 2015, brucellosis seroprevalence at Muddy Creek was back up to 21 percent. To learn how many of the seropositive elk were contagious, graduate student researchers followed the elk as they were trailered to a slaughter facility in Idaho, collected lymph node and tissue samples, and took them back to the lab for further testing. They found only about half of the seropositive elk (those carrying antibodies to brucellosis) were actually contagious (carrying brucellosis bacteria), fewer than expected. 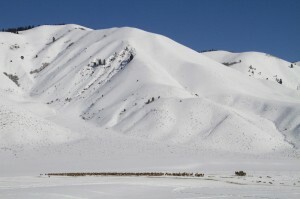 A snow-covered elk feedground in western Wyoming. Photo courtesy Mark Gocke/Wyoming Game and Fish Department. In another project during the test-and-slaughter campaign, Scurlock and his colleagues investigated disease transmission on feedgrounds. The thinking at the time was that if a cow elk saw a fetus on the ground, her maternal instincts would kick in and she would go out of her way to investigate it, thus contracting the infection. To test this, the team collected fetuses from the non-infectious seropositive pregnant elk sent to slaughter. They placed those frozen fetuses on feedgrounds, and field technicians observed and video taped how cow elk interacted with them. This study showed the “maternal instincts” idea was wrong: rather than walking toward a fetus once she saw it, a cow elk would only sniff or lick a fetus if she passed directly next to it. Fetuses spread out across the feedground had many fewer contacts compared to those on hay lines, where elk feed shoulder to shoulder and all walk along the same path. Scurlock also needed to know where and when cow elk were aborting. The only information he had came from feeders who happened to find a fetus on a feedground and report it. In this study, Game and Fish captured elk in the winter, and put vaginal implant transmitters, or VITs, into seropositive pregnant elk. The transmitters send out a signal researchers can detect with an antenna to pinpoint the location, date, and time to within a half hour of when the VIT was expelled. So far, Scurlock’s team has put out nearly 600 VITs and has documented about 30 reproductive failures. They’ve started to narrow down the time of year that abortions occur. Now Scurlock and his team are applying these findings to feedground management to try to reduce brucellosis prevalence among the fed elk. He’s focused for now on two “simple” ideas in the Target Feedground Program. For one, he’s changing how hay is distributed. Instead of placing hay in a line, Target Feedground Program feeders spread it in a checkerboard, reducing the likelihood that an elk will stumble across an aborted fetus. Second, he’s ending feeding earlier in the season at some Target Feedgrounds where neighboring cattle operations are not at risk, causing the elk to disperse into the hills just when abortions might happen and greatly reducing the transmission potential. He’s monitoring these two changes to determine how effective they’ll be at lowering brucellosis prevalence in the feedground elk, but doesn’t expect to see effects for another eight to ten years. But reducing brucellosis prevalence within feedground elk is just one small piece of the puzzle. The goal remains to eradicate the disease throughout the region. On the vaccine front, Strain 19, developed by USDA researchers in 1941, was the inoculation of choice for many decades, but it had its problems. It showed false positives in vaccinated animals, leading to scares as well as time-consuming and expensive additional testing. In addition, its effectiveness faded as the animal got older, but it wasn’t supposed to be administered more than once. In 1996 the USDA licensed a new vaccine for cattle called RB51. This one wouldn’t lead to false positives and could be administered multiple times. “Neither vaccine is that efficacious in cattle, or elk or bison for that matter,” says Galey. One study showed RB51 prevented only about 60 percent of cow infections and abortions. Strain 19, which since 1985 has been administered to feedground elk annually, leads to only a 25-30 percent difference in calving success compared to unvaccinated elk. 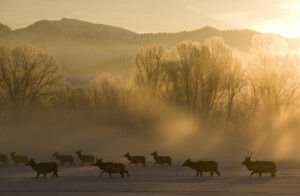 That may not matter any more as the bio-bullets used to administer the vaccine to elk are no longer being manufactured. “We just used the last of our bullets a couple weeks ago,” Scurlock says. Without bio-bullets there’s no realistic way to get the vaccine into thousands of wild elk each year. Elk in winter. Photo courtesy Mark Gocke/Wyoming Game and Fish Department. Rather, a more effective vaccine for cattle is greatly needed, but the hope to find one is stymied by the fact that brucellosis is classified as a bioterrorism agent. Any lab research of the disease has to be conduced in a Bio Safety Level 3 laboratory. “It makes these studies hideously more expensive than they need to be,” Galey says. The University of Wyoming, under Galey’s leadership, has constructed a BSL3 lab, but it’s had design challenges and has not yet been certified for operation. Though other such labs exist in the U.S., brucellosis vaccine research development hasn’t advanced much in recent years, in part, perhaps, because of the fact that it’s only really a concern for a handful of ranchers and elk hunters in a remote pocket of the country and not much on the national stage. While the rest of the country has washed its hands of the problem, the challenges in the Greater Yellowstone Area are daunting, and the millions of dollars of support U.S. Department of Agriculture Animal and Plant Health Inspection Service has sent to the region over the past decades are drying up. Now, it’s up to the states to wipe out the remaining pool of brucellosis. Galey and the Brucellosis Coordination Team will continue to push. He’s lobbied Congress to provide research funding for vaccine development, written letters to have Brucella removed from the bioterrorism list, and more. On the management side, some groups are calling on the state to close the feedgrounds, because they perpetuate the disease, create unsanitary conditions for the elk, disrupt migratory behavior, and otherwise convert an iconic wild species into feedlot stock. Montana has no feedgrounds, and Idaho operates only a couple. Still, other constituents support the feedgrounds either because they elevate elk numbers or stop elk from mingling with livestock. Game and Fish sets population objectives for each elk herd in the state. Of those herds that include feedgrounds, seven are within their population objectives and one is well above. That’s the Piney Herd Unit, which encompasses five feedgrounds southwest of Pinedale. There, Game and Fish sets liberal hunting quotas in an effort to reduce the number of elk, but much of the herd unit spans private land with challenging hunting access. To date decreases have only been minimal. Proposals to get rid of feedgrounds crash before they can get off the ground. “Feedgrounds currently have a lot of support in Wyoming, so ending a feedground is politically unfavorable and unlikely,” says Scurlock. Brucellosis, bad as it is, won’t be enough to end feedgrounds. An animal infected with CWD suffers and looks bad: its ribs stick out, head and ears droop, saliva strings from its mouth. If animals in such condition show up on the National Elk Refuge outside Jackson, Wyoming, where the U.S. Fish and Wildlife Service feeds about 6,000 elk each winter, for example, and photos of them make it onto social media, that could sway the feedground politics. “It will probably take something like that with a high mortality rate to say, hey, they [feedgrounds] are not serving their purpose any more by keeping elk alive,” Scurlock suggests. To monitor brucellosis, Wyoming Game and Fish collects blood samples from elk killed by hunters across the state. In recent years a few elk in the Bighorn Mountains, 40 miles east of the Greater Yellowstone Area, have turned up with brucellosis seroprevalence. It’s within reason to imagine elk might have wandered from Yellowstone down the Greybull River and across the Bighorn Basin to the Bighorns. The BCT is closely monitoring the situation, and has asked ranchers in the area to voluntarily test their herds in order to assure trading partners the animals are not infectious. Game and Fish, the U.S. Forest Service, and others are preparing to put collars on elk to track their movements and learn how the disease reached this new area. The 80-plus-year race to stop brucellosis continues. 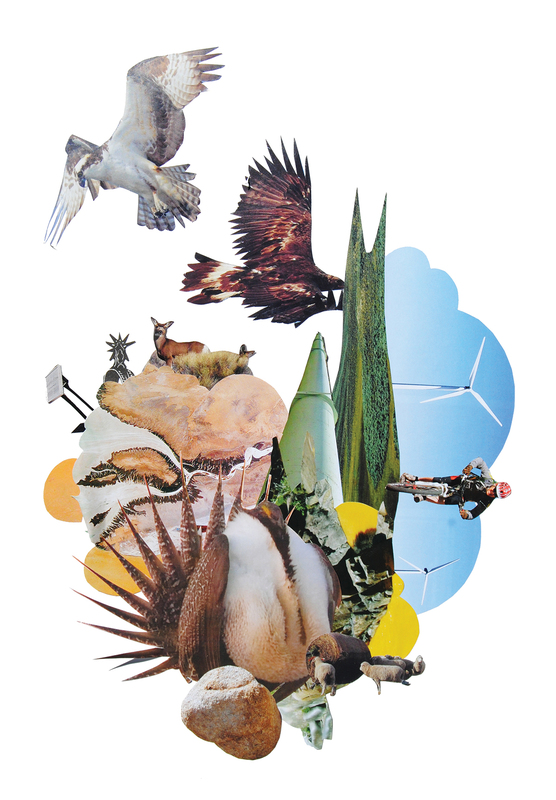 Like with many living things, now that it’s had a taste of the wild, the disease is running free. See a timeline illustrating A Brief History of Brucellosis. Wyoming Brucellosis Coordination Team Report and Recommendations, report to Governor Freudenthal (January 11, 2005). Terry Kreeger and Glenn Plumb, editors, Enhancing Brucellosis Vaccines, Vaccine Delivery, and Surveillance Diagnostics for Elk and Bison in the Greater Yellowstone Area: A Technical Report from a Working Symposium held August 16-18, 2005 at the University of Wyoming (United States Animal Health Association, 2006). Brandon Scurlock, William H. Edwards, Todd Cornish, and Laura Meadows, “Using test and slaughter to reduce prevalence of brucellosis in elk attending feedgrounds in the Pinedale elk herd unit of Wyoming: Results from a 5-year pilot project,” report to Wyoming Game and Fish Department (2010). P. Cross, E. Cole, A. Dobson, W. H. Edwards, K. Hamlin, G. Luikart, A. Middleton, B. Scurlock, and P. White, “Probable causes of increasing brucellosis in free-ranging elk of the Greater Yellowstone Ecosystem,” Ecological Applications (2010): 278-288, jstor.org/stable/27797805. Tyler Creech, Paul Cross, Brandon Scurlock, Eric Maichak, Jared Rogerson, John Henningsen, and Scott Creel, “Effects of low-density feeding on elk-fetus contact rates on Wyoming feedgrounds,” The Journal of Wildlife Management (2012): 877-886, doi:10.1002/jwmg.331. 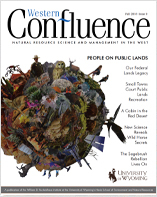 Jennifer Jones, Matthew Kauffman, Kevin Monteith, Brandon Scurlock, Shannon Albeke, and Paul Cross, “Supplemental feeding alters migration of a temperate ungulate,” Ecological Applications (2014) 1769-1779, doi:10.1890/13-2092.1.